Summer is home to many of the year’s most beautiful days, so who can blame you for wanting to spend them all outside? Your yard becomes your living room and your patio the kitchen. It’s your home away from home, which begs the question — do you like your current digs? If your home’s outdoor space lacks the comfort and appeals you are longing for, don’t worry. 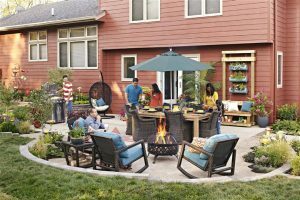 Now is the perfect time to transform your backyard into the perfect outdoor oasis you can enjoy all summer long. Think of the parties you’ve hosted in your home. They’ve likely all had a common gathering place such as the kitchen counter, the living room couch or the dining room table. Your outdoor space needs a similar location, and a dining set naturally invites guests to relax. Five-piece dining sets from Lowe’s are perfect for more intimate gatherings, while seven-piece sets comfortably accommodate larger crowds. Grilling out is a staple of any summer party, so if your existing grill isn’t hitting all cylinders, it’s time for an upgrade. The Master Forge 5-Burner Modular Gas Grill features four heavy-duty burners, one infrared searing burner, and one infrared rotisserie burner, giving you a solution for any menu choice. Plus, its built-in halogen lights can keep your party going long into the night. The sofas and armchairs in your living room are popular sitting destinations during an indoor event, and you can create the same environment outdoors with sectional patio furniture. The Garden Treasures Palm City Patio Sectional Furniture features sleek and sturdy black steel frames coupled with tan Olefin cushions that up to the comfort level, meaning when you sit, you’ll never want to leave. An all-day party means plenty of suns, and when guests need a break from the heat, it’s good to provide an area of relief. Patio umbrellas are an affordable option, available in 8-1/2 and 9-foot varieties, providing ample coverage for a large gathering. And to keep the awning a hot destination into the evening, look for an umbrella outfitted with LED lights. The difference between a backyard and an outdoor oasis is in the details you add to your space. Island King Garden Torches bring light to any situation. With durable metal construction and a long-lasting fiberglass wick, these lights will keep their look in any conditions. To add a little extra green space to your outdoor entertaining area, consider purchasing raised garden beds. They provide a grand ambiance upgrade to your oasis at an affordable price.